A comprehensive guide and fact sheet about Narmer Palette. Discover fascinating facts and information about ancient Egypt and Narmer Palette. Click a link for additional information and interesting facts about subjects relating to Narmer Palette or other aspects of daily life, the people and places of ancient Egypt. The Narmer Palette has a confusing name as we associate the word 'palette' with an artist's board. Just to clarify the term, the word Narmer is the name of the king who is depicted on this ancient artefact, which is also called called Narmer's Victory Palette. The term 'palette' was used by early Egyptologists to describe the cosmetic slate palettes of predynastic Egypt that were originally used to grind and apply ingredients for facial or body make-up. These early small cosmetic palettes were often inscribed with symbols and iconography and were some of the first forms of Egyptian hieroglyphics. Much larger pieces of slate were then used to carve structured sets of texts that were created as tributes to commemorate important events or for ceremonial purposes. The Narmer Palette measures 64 centimetres (over 2 feet) in height and 42 centimetres (about 17 inches) in width. Click the following link for additional facts and information about King Narmer. 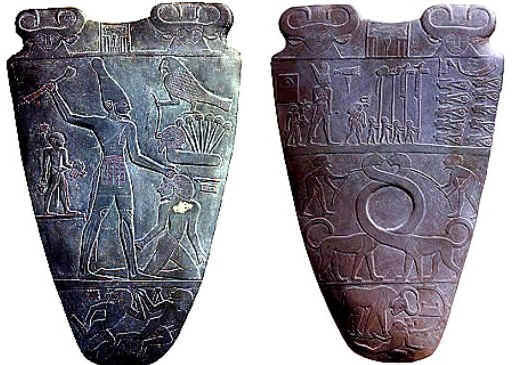 The Narmer Palette definition: Slate carvings commemorating the victory of King Narmer of the southern kingdom of Egypt over the northern kingdom and his unification of the two lands. Both sides are decorated and the hieroglyphic inscriptions are amongst the oldest ever found. The Narmer Palette depicts the unification of the two lands of Upper and Lower Egypt by King Narmer who is represented wearing both Egyptian crowns. This is first attestation of this historical event. The king is depicted as the conqueror of lands and the master of his vanquished enemies. The traditional enemies of Egypt were collectively referred to as the 'Nine Bows' reflecting the weapons used by their enemies. Fact 1 on Narmer Palette: Narmer was the King of the southern lands of Upper Egypt whose capital was Hierakonpolis. Fact 3 on Narmer Palette: The slate artefact measures 64 centimetres (over 2 feet) in height and 42 centimetres (about 17 inches) in width. Fact 4 on Narmer Palette: It was discovered by British archaeologists James E. Quibell and Frederick W. Green 1897–1898. Fact 5 on Narmer Palette: It was found in the Temple of Horus at Hierakonpolis, which was originally known as Nekhen. Fact 6 on Narmer Palette: The 'Narmer Palette' is important because it contains some of the earliest hieroglyphic inscriptions ever found. Fact 7 on Narmer Palette: It dates from the reign of the king c3100BC. Fact 8 on Narmer Palette: Meaning: The meaning of the artefact refers to the unification of Egypt. This is clearly depicted in the front of the artefact with the king wearing the White Crown of Upper Egypt, and on the reverse he wears the the Red Crown of Lower Egypt. Fact 9 on Narmer Palette: The artefact is now one of the many exhibits at the Egyptian Museum in Cairo. Fact 10 on Narmer Palette: It is one of the most important sources of information about Early Dynastic Egypt and the unification of the 'two lands'. Discover fast, interesting fun facts about Narmer Palette for kids with some amazing, cool and quick information about ancient Egypt and Egyptians. Ideal for children, homework, schools, teachers and kids of all ages! Find fascinating fun facts about Narmer Palette for kids and the history, culture and civilisation of the ancient Egyptians and ancient Egypt. Interesting, fun facts about Narmer Palette for research, schools, students and kids of all ages. Learn about Narmer Palette the fast and easy way via the Narmer Palette Fact sheet. Fact 12 on Narmer Palette: The inscription in the Pyramid texts "...I am Bat with Her Two Faces..." supports the theory that it is the goddess Bat and not the later goddess Hathor who is depicted on the ancient artefact. Fact 13 on Narmer Palette: The name of the king is inscribed in a serekh between the heads of the goddess Bat. Fact 14 on Narmer Palette: The serekh was the earliest convention used to set apart the royal name in ancient Egyptian iconography, before the cartouche was used. A chisel above a catfish was the symbol for the king's name. Fact 17 on Narmer Palette: Front Depiction: The theme of defeating the enemies continues with the king grasping the head of an enemy and standing upon his naked enemies. In Egyptian art there are no representation of facial hair other than the stylized false pharaonic beard. Enemies were portrayed wearing beards, as a sign of being foreigners. Fact 18 on Narmer Palette: Front Depiction: The small depiction of a servant, or perhaps a priest, to the left of the king carries the king's sandals. In Egyptian art gods and kings are always depicted with bare feet, emphasizing their close connection with the land of Egypt. Fact 19 on Narmer Palette: Front Depiction: The following section of the carving depicts papyrus reeds (a symbol of lower Egypt). In early Egyptian hieroglyphs a papyrus blossom stood for the numeral 1000 - this group therefore means that the king had captured six thousand enemies. Learn about this ancient artefact the fast and easy way via the following Fact sheet. Fact 20 on Narmer Palette: Reverse Depiction: The back of the Narmer Palette is divided into four levels: the King's name with the protection of the goddess Bat, Narmer inspecting the bodies of slain enemies, the taming of wild animals and a bull, symbolising the king destroying the walls of fortress. Fact 21 on Narmer Palette: The king is represented wearing the Deshret Crown of Lower Egypt. 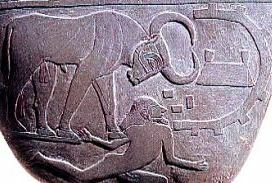 Fact 24 on Narmer Palette: This scene depicts a mighty, raging bull trampling on an enemy of Egypt and attacking a city or fortress surrounded by walls. 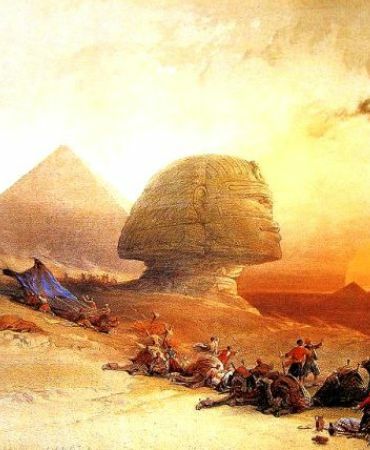 Learning about the ancient Egyptians and ancient artefacts inspires everyone to visit historical sites and undertake Egypt Travel and Tours to experience the wonders of this magical land at first hand. Many people choose to experience a tour of Egypt on a Nile Cruise stopping at the famous destinations and sites of Egypt such as the Pyramids of Giza and the Great Sphinx. The information and facts about this ancient artefact will provide you with a great insight into Egypt and the legacy of the ancient Egyptians.